reduce scale build-up even under the hardest water conditions. to reduce chlorine taste and odor. Ice looks and tastes better. with automatic shut-off and pressure relief valves. will indicate if replacement is necessary prior to six months usage (below 20 psig). 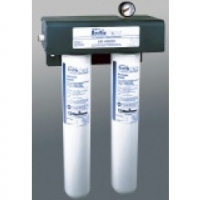 actual water treatment needs before purchasing a water treatment unit. adequate disinfections before or after the unit. Caution: The filter must be protected from freezing.